We need your home baked items for the Women in Missions Annual Palm Sunday Bake Sale. Make your plans now to bake your favorite item for this year’s sale. Your contribution will help support the WIM college scholarship fund that benefits our youth and young adults. Deliver to the church on Saturday, April 13. Contact Charlean Grobe or Vicki Bowers for more information. Shop for your Easter treats at the annual Women in Missions Palm Sunday Bake Sale. Choose from home baked cookies, cupcakes, pies, cakes, and more, all lovingly prepared by members of the FUMC Allen congregation.. In fact, you can buy your meats from the UMM SMOKEOUT and your desserts from the Women in Missions as you plan your Palm Sunday and Holy Week meals. And, while you are at it, buy something for a friend. 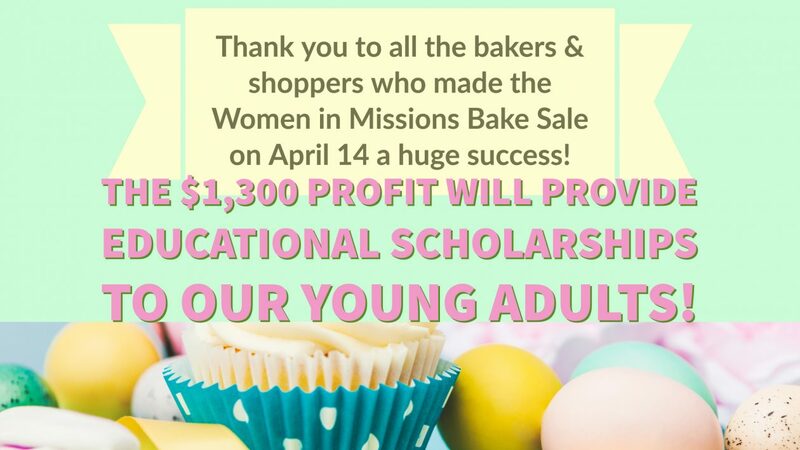 Your support of this bake sale benefits the Women in Missions college scholarship fund, which directly supports our youth and young adults.